The Infinity-O display is one of four new versions that Samsung revealed at its developers’ conference earlier this month. Samsung essentially has solutions for notch, no notch and even panels with a hole for the camera. We were only shown an outline of these new displays at SDC 2018 and it may be a while before we see them on a device. A recent leak claims to give us our first look at the Infinity-O Display assembly. There’s not much that can be gleaned from it other than the panel having a hole in the top corner. It may debut first on a mid-range device. Samsung teased a device with such a display panel even before it revealed the Infinity-O. It teased the Galaxy A8s during the launch event for the Galaxy A9s and Galaxy A6s in China. The teaser showed that the display doesn’t have a notch. It was mentioned in subsequent reports that the display would actually have a hole to accommodate the front camera. The display silhouette that Samsung revealed at SDC 2018 essentially confirmed that to be the case. It has developed a new type of display with a hole in the corner for the front camera. This would allow the company to maximize screen real estate even on devices that don’t get the New Infinity display (New Infinity is the all-screen version with an under-screen camera). That would likely be reserved for the premium handsets. 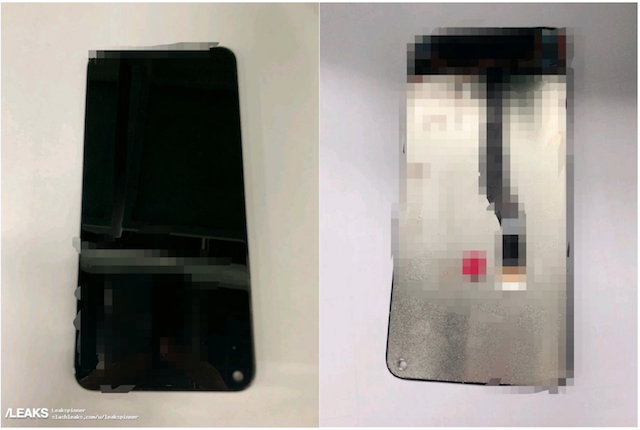 The leaked display assembly also has a hole in the top corner. It’s in line with what’s known so far about the Infinity-O display. Granted, it’s not difficult to fabricate this, all you need to do is drill a hole in a display assembly after all. There’s nothing there to suggest that it’s from Samsung. We can expect similar leaks to surface in the coming weeks as the Galaxy A8s is expected to arrive in early 2019. No word as yet on the devices which will bring Samsung’s Infinity-V and Infinity-U notched displays to market. Don’t expect me to buy that crap. What is new Infinity display ? The full-screen one that will be on the top Galaxy S10 models. Why the pictures are blurred ? All this notch business has reminded me of the original LG V10, which had a second display next to the camera, very much like what today’s notches have the potential to be, instead of just wasted space. Yes. You want put display in notch place. And where’s camera, and sensors will be ?